took a lot of effort to wear any hat other than my black bowler. but i thought this outfit needed something other than just black and camel. i bought this dress on ebay and the seller said it was a plain black zara dress that they'd sewn the cute collar on. i like it a lot but it is such a heavy material and just a bit too bulky. definitely not a summer dress at all. promise to stop wearing these shoes soon. even i'm getting a little sick of seeing them in every single outfit photo so you guys must just be really annoyed! i'm trying to find a few cheap pairs of similar shoes, low-ish heeled loafers or brogues but it's beyond difficult. took this photo when we had a stroll along the seafront at the weekend. as you can see the weather was miserable, but i was determined to get a few photos with a little bit of sand and ocean in. Love your cardigan, and I love the little splash of colour that beret brings to the outfit! I really love the mixture of different colours here, and the beret really suits you! love the little lace collar & the last photo of you is lovely. those pictures are sooo beautiful, especially the last one. 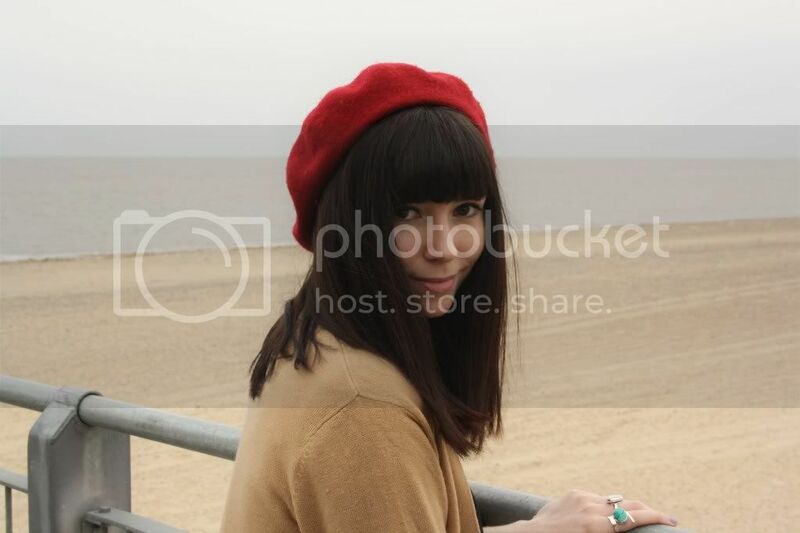 i wish i had the chance to go to the sea more often :) i really adore your outfit and the beret suits you so good! each of your outfits is truly an inspiration, would love to see your jewelery more often. those kinds look brill! so cute, love the collar! The black dress is rather cute. I rally like dresses with peter pan collars. You look so classy, the last picture... beautiful. very cute !! I love the last pic. I love these pictures and your outfit. The collar is great. That last photo of you is absolutely beautiful. wow sarah I really love ur style ! ur so lovely girl I'm a big fan of you ! How cute is that dress? The lace collar is so adorable.